On August 10, 1636, a small group of highly dedicated historians put down their pens and probably soaked their aching wrists after completing the most extensive and valuable history of Ireland ever produced – and it was produced under the noses of an anti-Irish-Catholic government that would have arrested them had they known. Their coverage of Ireland’s history begins at about 3,000 years before Christ and ends at 1616 AD. The principal compiler of the effort was Michael O’Cleary, a native of Donegal, who was a trained antiquary and poet. O’Cleary joined the Franciscan Order, and went to their Friary in Louvain for there was no place in hs own country that a man could train for Holy Orders. In 1607, the Irish Franciscans had fled Ireland and founded a school at Louvain (now Leuveu in Belgium) which became, for centuries, a haven for Irish clerical students and a great center of learning. Dedicated to history, one of their projects involved secretly returning to Ireland to collect documents on the lives of Irish kings before they were destroyed by the coming violence. O’Cleary’s famous compatriot at Louvain, Father John Colgin, recognizing the talent that O’Cleary possessed, sent him back to Ireland to document the lives of Irish saints. It was a dangerous mission, but he succeeded and many of the biographies which he wrote from old vellum manuscripts, are still in the Burgundian Library at Brussels. Recognizing that many of these old vellum writings were fragile and fading, he conceived the idea of collecting and combining all the ancient vellum writings of local annals that he could find throughout Ireland and putting them together in chronological order into an all-encompassing Annals of the Kingdom of Ireland. I thought, he said, that I could get the assistance of the chroniclers for whom I had most esteem, in writing a book of annals in which these matters might be put on record, for should the writing of them be neglected at present, they would not again be found to be put on record even to the end of the world. All the best and most copious books of annals that I could find throughout all Ireland were collected by me, though it was difficult to collect them into one place to write this book. His forebodings as to the fate of the material that he found to work from were prophetic. Scarcely one of the ancient books which he brought together with such pains has survived to the present day, destroyed during the Cromwellian Persecution, the Williamite wars and England’s continued attempts to destroy Irish culture. In 1632, after a search of fifteen years throughout the country for the most important Irish documents, this learned friar retired to the secluded Franciscan friary at Bundrowes in south County Donegal. With three hand-picked men of consummate knowledge in the antiquities of their land, namely Farfassa O’Mulconry, Peregrine O’Clery, and Peregrine O’Duignan, they set to work. Occasionally other distinguished and trusted antiquarians, like Maurice O’Mulconry assisted for a month and Conary O’Clery assisted for several months. But it was the four original scholars who accomplished the intellectual bulk of the work and were considered the most learned masters of Ireland’s ancient lore and they are remembered as Na Ceithre Máistrí or the Four Masters and the title they chose for their work Annals of the Kingdom of Ireland quickly became known as The Annals of the Four Masters. 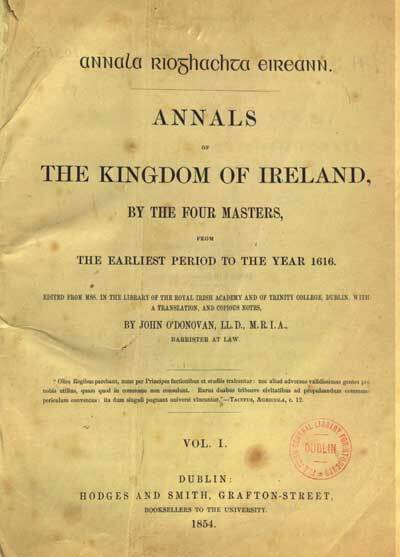 The Annals of the Four Masters is the most extensive compilation of the early history of Ireland. It is mainly a compilation of earlier annals, although there is significant original work. The entries for the twelfth century and earlier are sourced from medieval annals of the community. The later entries come from the records of the Irish aristocracy (such as the Annals of Ulster), and the seventeenth-century entries are based on personal recollection and observation. They were compiled in the secluded friary under the patronage of Fergal O’Gara, Lord of Coolavin in Co. Sligo and it was to him that the ‘Annals’ were dedicated. Although O’Cleary was the only Franciscan Friar in the group, the Franciscans supplied the food and lodging for all of the Four Masters and their guests during the entire effort which was commenced the 22nd of January, 1632, and concluded on the 10th of August, 1636. Written in Irish, it includes great battles and victors; the genealogy of the native Irish, the Anglo-Norman; and English possessors of land in Ireland. Irish Laws, manners, customs, and notable characters in Irish history are described along with ‘antiquities of every county’. The Annals detail the reigns, deaths, and successors of the high-kings of Ireland, the provincial kings, chiefs, and heads of distinguished families. Men of science, Historians, Poets and Priests were defined with deeds and dates as accurate as the Masters were able to give them. They recorded the demise and succession of saints, abbots, bishops, and ecclesiastical dignitaries. They tell of the foundation and the occasional destruction or seizure of countless churches, castles, abbeys, convents, and religious institutions. They give minute details of battles, murders, tribal wars, wars with the foreigners, battles with Norsemen, Normans, and English, and political changes. Sometimes they even quote ancient verses in corroboration of the facts they mention. The care that they displayed as they assembled the documentary evidence of Ireland’s history, and their approach conveyed in preparing the presentation of the Annals showed their regard for the older written records that had preserved for them, in manuscript, the history of their ancestors. 1. It provided a valuable insight into these historical events from a Gaelic Irish perspective. 2. It lit a fire of pride in their race for it consisted of great men and patriots who fought for their rights. 3. It showed that they were not an uneducated, worthless slave economy to obey the whims of the landlord. The Annals of the Four Masters influenced the writing of national history from the 17th century onwards. Its importance increased when the annals were translated and published in 1846 by Owen Connellan and later in five large volumes between 1848 and 1851 by the great scholar John O’Donovan. O’Donovans translation was later republished in seven smaller volumes. O’Donovan’s work includes an abundance of the most valuable notes, topographical, genealogical, and historical data. Several manuscript copies of the Annals are held at Trinity College Dublin, the Royal Irish Academy, University College Dublin and the National Library of Ireland. 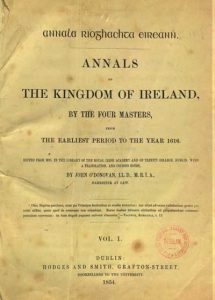 Although just one of several Irish annals, the Annals of the Four Masters is the most comprehensive and best-known account of ancient Irish history (and the one most often referred to) for it is based on earlier historical records (some of which have now been irretrievably lost). It is safe to say that if the Four Masters had not undertaken that tremendous task, much of Ireland’s history would have been lost forever; God bless their memory!